In a previous article we wrote about the “Tao of Small World”. The notion that we are but a few optimal communicable steps away from each other no matter where we are on the Planet! Kevin Bacon popularized this notion recently, a development of the "Six Degrees of Separation" although most of us will no doubt have experienced aspects of what a small world indeed it can be. I admire George Clooney both for his cinematic artistry and the good work he does ... the Six Degrees of Separation connected us in our article "The Tao of Small World".. The mathematical calculations mentioned in "The Tao of Small World" are amazing, showing that in social media we can empirically find such a 'brevity of distance' between any of us. 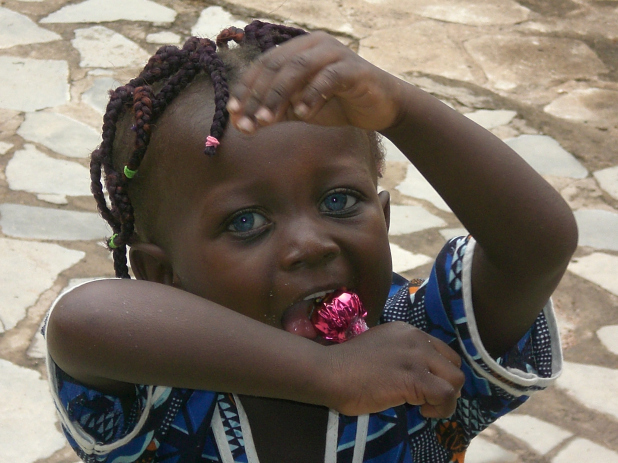 The photograph of the girl with the blue eyes is '(sort of ) such an example - although it was staring us in the face! Taken by Claudia Pontel, a missionary in the Ivory Coast, it is a remarkable picture and makes me think of that iconic image of a girl with green eyes – in Afghanistan. I have to say that the image of the girl with green eyes haunts me. I saw it in National Geographic when it first appeared and it maybe the digital Mona Lisa - what is deep behind those translucent green eyes!? There is an ache therein that I have never been able to fully comprehend. The photographer, Steve McCurry, who took that picture will always be remembered for that picture, regardless of whatever else he has achieved in Life. If this planet survives it may yet be the definitive digital image for Humanity. 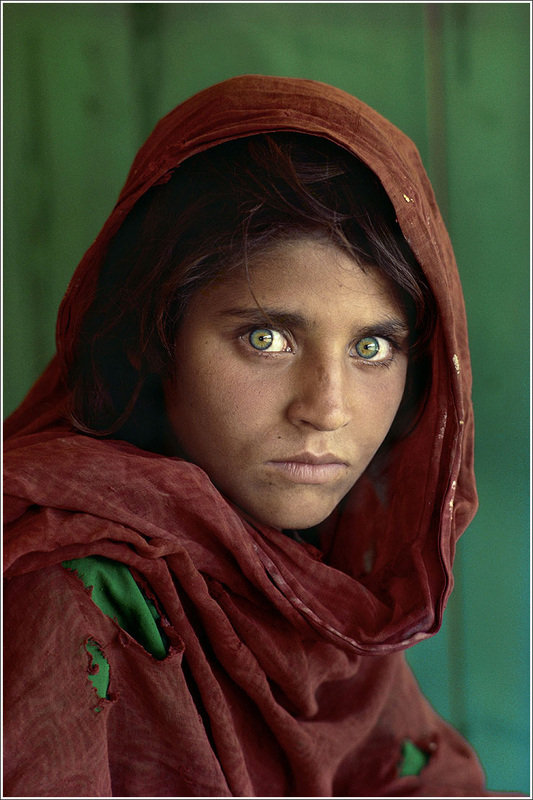 Many years later McCurry returned to Afghanistan, and searched for the little girl. Remarkably, almost miraculously, he was able to trace her ... and indeed he found her. Sadly, Life seemed not much better for her when he found her than the moment when her green eyes became famous forever all over the world. She grew up to be married, has had children and a family ... but throughout she has lived in war! A lifetime of war! Those green eyes that stare at you are challenging, almost accusing, as if to say, surely with all the beauty that is Life how can this be happening? We have not yet answered that question in full, although coming from South Africa I think we found some answers in the extraordinary conflict resolution that this country achieved. But then Mandela is extraordinary, beyond comprehension! Us white South Africans were divided, between English speaking and Afrikaans speaking. So, at most, the Apartheid presidents had about 60% of the white support. We were 40% English speaking and 60% Afrikaans speaking, as white South Africans. But as a 100% unit we were the polecats of the world! As an Italian English speaking South African I truly only discovered my Afrikaans speaking compatriots when I had had to do military service. Many of my friends left the country rather than do military service. I ended up in the Navy, fortunately away from the border war. I became very good friends with an enlightened Afrikaner, who years later pointed out that the most popular President white South Africans have ever had is Mandela! it is an ironic and wonderful truism! God, we hated the Afrikaans leaders, yet very few white South Africans do not admire Mandela! He is the most popular President white South Africans have ever had! This may be a difficult thing to appreciate if you are not a white South African, and racists like Julius Malema would not understand this at all. I believe however, that our President, the much maligned, Jacob Zuma, however has understood this. He is a peacemaker, having helped to bring peace n KwaZukuNatal, where a virtual civil war was taking place between the ANC and the IFP! Few give him credit for this - is there any material value that one can place on saving a single life! So, when our national anthem is sung I cry every time! I cannot help it ... and truly, I do not even try to not cry! In 1995 the Spingboks, our national rugby team, won the Rugby World Cup. In Cape Town, black taxis were rocking with celebration: Amabokkebokke! Clenched fists in celebration! This was a powerful image, difficult to explain! yes, this is a very difficult concept to explain to someone who is not South African ... but that is why when our national anthem is sung I cry every time! Cynics like the Pilgers of this world will not find a kind word for any of this, but a Christ or a Buddha would understand and smile! Humanity has prevailed, mission accomplished! A living Lennon would also smile ... "Imagine" is the achievement of South Africa despite the Julius Malemas and the Thabo Mbekis, the vulture capitalists like Singer who buy up sovereign debt then bribe Ghanaian judges to impound the Argentinian Libertad. We have a wonderful expression of disgust thanks to the Afrikaans language: Sies! Yes, sies on all the vultures and scavengers and tyrants of this world, for whatever ideology or creed or culture or economic system on whose behalf they act! Those green eyes of that girl are stunning ... shining in an intensity of beautiful, magnificent innocence, desirous of hope. It may have been better to have never known the real life outcome for such magnificence - how the world failed the Girl with the Green Eyes. She deserved better, not only for herself, but as a symbol of all children, for all children. All children deserve better – her green eyes are but a sharp focus for us to see that she is/was representative of all children, she is all the children, everywhere, right now, in the past, and in the future. The photographer found her through some remarkable coincidences, almost easily, effortlessly. Yet, if we consider the Six Degrees of Separation perhaps it is what we should have expected, in optimal alignments - but still a war has raged in this area almost forever! But perhaps often the communicable contact is staring at you! More than a century ago a family of Italian immigrants returned to Italy from Brasil, a decade or so before the First World War. The two sons grew up and farmed together on the outskirts of a little village called Aiello del Friuli, in North East Italy. Hemingway experienced this area during the First World War. The ravages of war reduced the earnings of the returned immigrant family, the savings of a lifetime devalued to nigh insignificance. They lived as an extended family, adjacent to each other, married, had children, grew old. One of the daughters (my mother) married a blacksmith, son of a chimney sweep, and after the 2nd World War they emigrated to South Africa to pay off yet more debts. Decades elapsed, the various cousins married, had families. On the few trips back I met up with these cousins of my parents, and briefly saw some of their own children, a string of second cousins.. It was all a blur, I cannot recall the girl that Claudia may have been, we were on the other side of the world at the Southern end of Africa, they were in Aiello, far removed, life flowed by, cultures apart - a greater distance than physical space. I have these energitec parents: Euguenia, 83 and a 33 year survivor of breast cancer! Silvano, almost blind, but fit as a fiddle, still capable of walking in our Table Mountain trails. My parents fly back and forth in their old age, spending six months there in Italy and six months here, and mentioned that Claudia, a second cousin, was now in Ivory Coast after having done missionary work in Latin America. In the end I really needed to google once only: “Claudia Pontel” ... and spotted her blog on the first page of results. Indeed, what a small world! What a trivial effortless act ... the Six Degrees of Separation are not even a factor, it was staring at me in the face. There is a woman in the pictures who must surely be Claudia, this second cousin of mine, a stranger nonetheless. A missionary, working with AIDS communities, in environments that surely are harsh compared to the comfort of Aiello. What drove her to such places, leaving comfort behind ... therein lies one of the beauties of Life? As I write, she may not even recall that her father grew up with my mother, even a detail like that can over time and space be a small detail, even forgotten in the maelstrom of Life. My grandmother and her grandmother took turns working in the field and housekeeping for Bepi and Rico's extended families! Bepu was my grandfather and Rico was his younger brother, Claudia's grandfather. The blog is in Italian and I was unable to find an obvious email address; leaving a comment also defied me ... so I have yet to make contact. I could phone Italy but it would be a long story trying to make myself understood to elderly people who I hardly know. Yet I am proud of this Claudia, whoever she is, proud also of the stunning image she took of a vulnerable yet happy looking girl with blue eyes. Perhaps this girl with blue eyes may be spared the misery that seems to have been the life of the Girl with the Green Eyes? Perhaps Claudia and her fellow missionaries may make a difference, and the cruel and unforgiving acts and policies of merciless and unscrupulous men the world over will not bring misery and torment upon these communities? Perhaps that remarkable, fearless fourteen year old girl who frightened an entire army of cruel and merciless men, Malala Yousufzai, to the extent that petrified of her influence they resorted to shooting her in the head, may yet make a difference? Perhaps, the Warlords of every ilk and creed and culture that do their destructive work everywhere, may yet be reigned in? Perhaps, unlike the sadness in those magnificent green eyes below that should haunt all of us, the blue eyes of this girl decades from now will be happy and joyful … ? Perhaps such a dream is only a collective Six Degrees of Separation away ... ?